All 15.6 km of it. Mark and I went out for a skate yesterday, and it was one of those rare days when three main conditions are met, creating the perfect day for skating: 1: not too cold, 2: not too busy, 3: nice, smooth ice. The fact that it was sunny was just a bonus! And judging by the mild forecast for Monday, and the speed at which the trucks on the ice were removing signs, kiosks, and benches—leaving behind people's boots, and undoubtedly causing confusion and frustration when those boot owners return and have no bench to sit on!—this is likely to be the last skate of the season. We were having such a good time, and since there may not be a chance to skate on the canal for another 10 months, we ended up skating the entire length of the canal, all 15.6 km of it. Including two passes of the Dow's Lake loop, the Patterson Creek loop (where we started), and the bit down to the locks. We generally avoid the downtown section, because the ice from the top to the Somerset bridge is generally in terrible condition, as it is the favoured place for Winterlude tourists to experience the canal, and rightly so, owing to it's proximity to Confederation Park (where the ice sculptures are) the Byward Market, and the picturesque spires of Parliament and the Château, and the lovely spans of the Laurier and Mackenzie King bridges arching over the canal. But the ice was surprisingly decent, and we only had to "walk" the last few meters around the 0.0 km marker in the soft, choppy ice. I'm a bit stiff today, but it was definitely worth it. And yes, we couldn't skate past all the BeaverTail kiosks, smelling those heavenly wafts of fried cinnamon and not have one! I pass this tree on my walk home from work everyday. 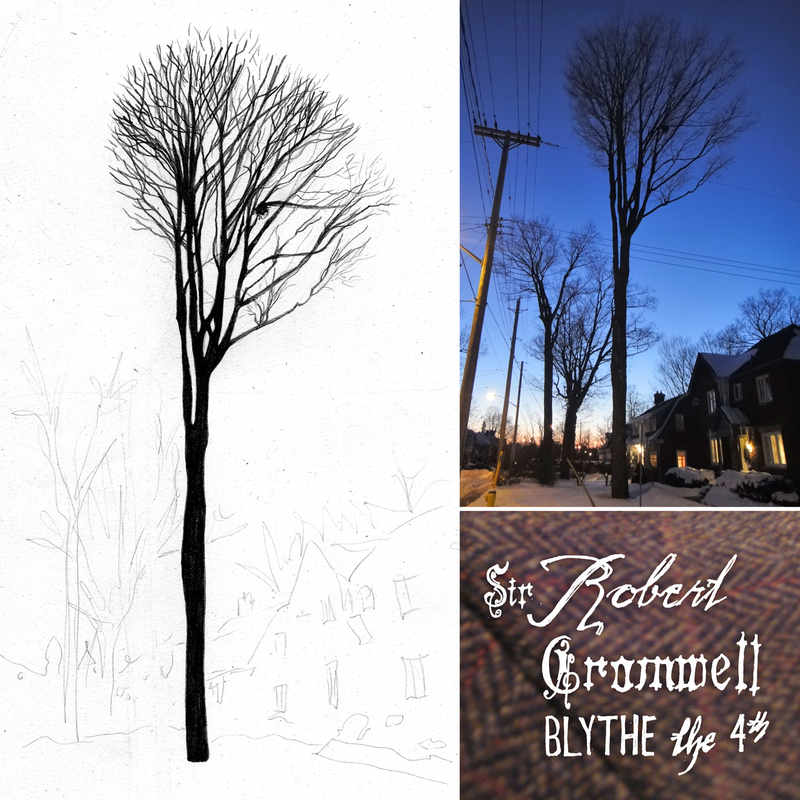 The tree's striking, rod-straight posture is distinctly eye-catching. That and the fact that it towers over the surrounding trees and houses, which themselves are not small. There is a chip in one of the tiles in my bathroom. Many helpful and well-meaning people have suggested ways to fix it; fill it in, but I think I'll leave it. You see, I kind of like it. If you look at it from the bathtub side of the room, it looks quite a bit like a bird. Some sort of hummingbird-duck hybrid. I like those little surprises when you realize that you can find inspiration anywhere. I mean, what fun is it to see a chip in the floor as a chip in the floor? I was going through the cupboards on the weekend and unearthed some long-forgotten foodstuffs, among them, a seasoning packet for slow-cooker stew. I've been looking to recruit the slow-cooker to aid me in making quick meals, but hadn't found any recipes that can be prepared quickly in the morning and left for 8 hours while I'm at work. 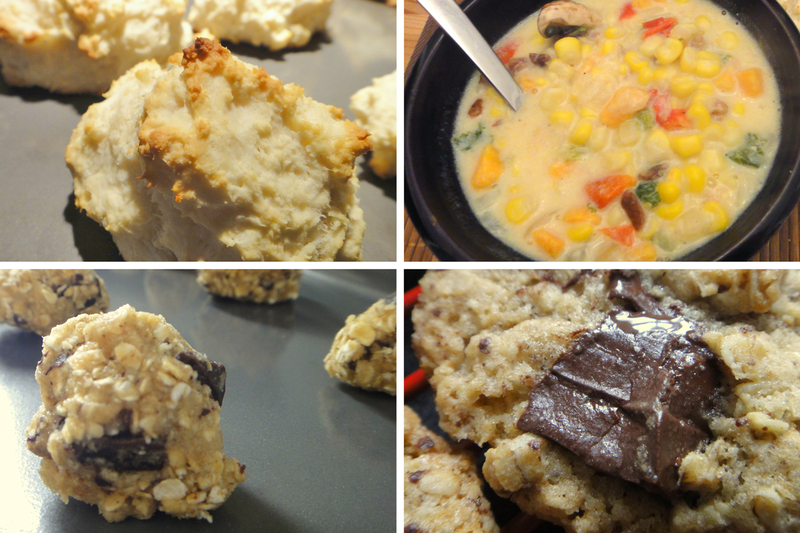 This packet recipe was just the ticket in that respect, but the packet itself was suspect. Aside from the obvious gamble of using something that's been in our cupboards for... years... it's also full of things that I try and avoid. It basically an over-salted, hydrogenated, mass-produced mixture of spices which I have the fresher versions of in my fridge and spice drawer. So why bother? Well, I really, really hate wasting things. So I decided to use it, rather than throw it out. Couldn't have been simpler to make: cut meat. Put in pot. Cut veggies. Put in pot. Mix packet with water. Put in pot. Turn on for 8 hours. And voila! And I'm sad to say that the packet did not exceed the already low expectations I had for it. The stew was very salty, and had that distinctly un-homemade taste. It tasted like it came from a can. Bummer. Furthermore, as great as the slow-cooker is, I kind of prefer making things that require attentive stove-top love. When I talk about wanting to take back the kitchen, this is not the way I want to conquer. I want to be more hands-on. But anyway, enough about that. Let's move on to the thing that made the meal delicious, despite the lack-lustre stew: the tea biscuits. This tea biscuit recipe is imprinted on the tree rings of my youth. I have very fond memories of these tea biscuits of which my dad was the primary baker. He made them all the time to accompany my mom's stews and soups, and would whip up a batch if I had a stomach-ache and we would have them plain, or with honey or jam. Pure comfort food. Oh, and the tea biscuit paraphanelia: to keep the biscuits warm on the table, they were put in a basket that was covered with a folksy, fabric rooster, and you had to lift it's wing to take one out. These tea biscuits also made excellent missiles for table-top battles between my brother and I, to the dismay of our dining guests. Once, in University, I called my dad for the recipe and was shocked when he said he'd need to consult his recipe book. Recipe book?! What recipe book? I thought it was your recipe! I thought you knew it like a homing pigeon knows where to fly! To be melodramatic, I'd say that a core idea in my belief system was shattered that day. But, at least the book in question was the venerable Beard on Bread. Ok, I suppose I can live with that. 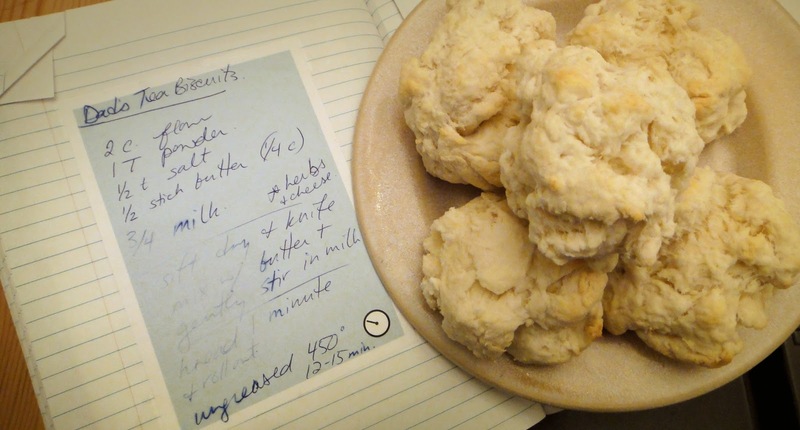 But in my recipe notebook where I scribbled it, I call it "Dad's Tea Biscuits." But in case the James Beard Foundation is reading this (yeah, right), here's the recipe posted on their site. The pile of yummy yummy fabric sat, untouched (save for frequent peeking), for almost 2 months before I started the first step: tracing and cutting. I'm pretty sure I giggled with joy everytime I lifted the lid on the box of fabric to goggle at the radiant colours. Might have even dreamed about them. I've had a couple of tracing/cutting sessions now, and the productivity of a cutting session, I've noticed, increases in direct proportion to the tempo of the music I'm listening to. So far the Supreme's Greatest Hits and Billy Talent has yielded the highest output. Great Lake Swimmers, on the other hand, produced only a modest quantity. So far there is no wastage. However small, I'm keeping all of my scraps, to make into future craft projects. But in the meantime, I'm growing increasingly enamoured with the scrappy pile of colourful negative space. Think I might put the bits in a big Mason jar. Like an eye-candy jar. I made a scale diagram on my computer and determined that for the size (Queen) and drop (about 6 inches), that I'm going to need to cut 559 full hex's and 69 half hex's. Phew! I've got my work cut out for me! But like I said before, I'm in no rush and I know this will take many months, if not years. But first, I should mention that I had great success on the weekend, which I attribute to having more time to get an early start on things. I made a delicious corn chowder on the fly, substituting sweet potatoes for regular potatoes, and adding a few extra veggies, like the slightly wilting kale and mushrooms I had in the fridge; with tea biscuits (my dad's recipe, which I'll share in another post sometime). Hearty and delicious! And then I made some yummy oatmeal-dark-chocolate-chunk cookies for a super-fun SuperBowl party we went to (Thanks J&C!). I'm a bit of a purist when it comes to the legendary BeaverTail. I feel there must be one simple condition for consumption to take place: you must be on the canal. So, obviously, it's not often I get a chance to have one. Just those few weeks of the year when the stars align and temperatures drop for periods long enough, creating ice conditions favourable for the canal to open. This morning I did something I haven't done in... a while. I painted. For fun. 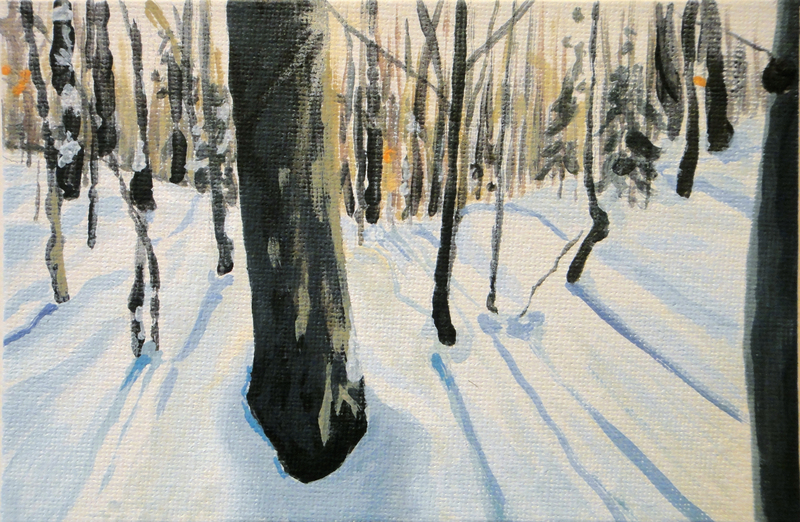 Just a quick 4x6 paint-sketch in acrylics of a photo I took last weekend. I thought of using a grid to get my proportions accurate, but decided against it for this quick project. Also, I was so eager to get started, I barely took the time to sketch it in pencil at all before attacking it with paint. The only "rule" I set for myself was not using black. I wanted the dark areas to have a richness that sometimes I find hard to achieve with black. It can be too dense, and when lightened with white, can sometimes seem too cold. I might try variations using black, or perhaps only black and white to explore the tonalities. 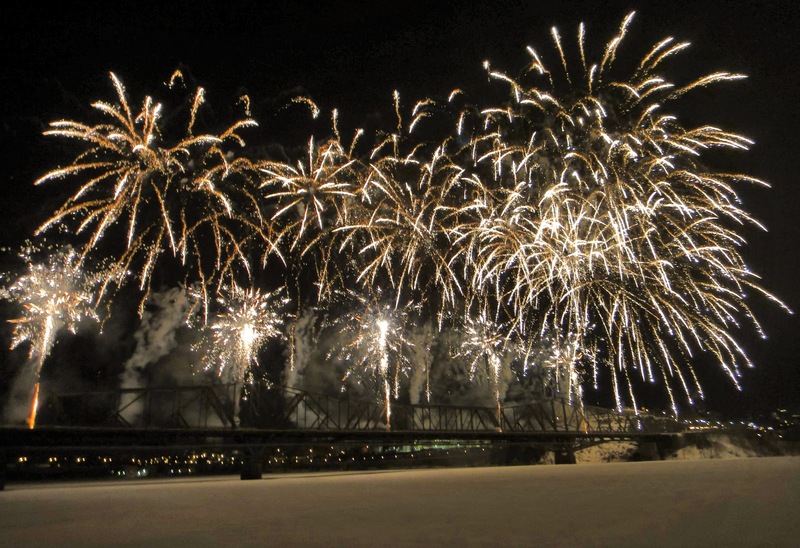 Winterlude began last night with festivities at the Museum of Civilizations, including various performers, singers, dancers, activities, free admission to the Museum (which was open until 11pm), and fantastic fireworks! A too-good-to-be-true, utterly indulgent, weekend spent among the trees, traversing frozen lakes, scaling hills, and cozying up by the fire; bellies full of cheese fondue, baguette, chocolate fondue, pancakes, fresh fruit, and more than a little bit of wine. Back in November, Mark and I booked this cottage near(ish) Tremblant for 2 nights, knowing it would be nice to have a mid-winter getaway to look forward to, although not the typically southern location of most mid-winter escapes. This getaway was not to getaway from winter, but to fully immerse in all the wonderful things about winter! We had initially been looking for a little one-room cabin, but couldn't find any that weren't tied to a larger resort that required the purchase of a meal plan. But it was lovely, and the experience was great (having never rented a cottage before). Sticking with my intention to master some simpler meals to build my confidence back up, I found this fantastic recipe: Curried Israeli Couscous and Lentil Pilaf. From stove to table was only half an hour—including a spontaneous side salad—quite possibly a record for me. Not only that, it was phenomenally tasty! I'm so proud of me! And I have leftovers for lunches. Triple win. I used fresh carrots instead of frozen and re-hydrated lentils as an alternative to using canned—which tend to be high in sodium and a bit mushy—but otherwise followed the recipe. My couscous absorbed the liquid in less than 3 minutes even though I had it on low heat; not a problem, just a comment. But nothing boiled over or burnt, and the kitchen wasn't even a mess when I was done. This has certainly bolstered my spirits in the kitchen and I'm excited to plan next week's meal!